© 2018 The Author(s). Published by Elsevier Ltd.
As the Planetary Health Alliance moves forward after a productive second annual meeting, a discussion on the rapid global proliferation of artificial electromagnetic fields would now be apt. The most notable is the blanket of radiofrequency electromagnetic radiation, largely microwave radiation generated for wireless communication and surveillance technologies, as mounting scientific evidence suggests that prolonged exposure to radiofrequency electromagnetic radiation has serious biological and health effects. However, public exposure regulations in most countries continue to be based on the guidelines of the International Commission on Non-Ionizing Radiation Protection1 and Institute of Electrical and Electronics Engineers,2 which were established in the 1990s on the belief that only acute thermal effects are hazardous. Prevention of tissue heating by radiofrequency electromagnetic radiation is now proven to be ineffective in preventing biochemical and physiological interference. For example, acute non-thermal exposure has been shown to alter human brain metabolism by NIH scientists,3 electrical activity in the brain,4 and systemic immune responses.5 Chronic exposure has been associated with increased oxidative stress and DNA damage6, 7 and cancer risk.8 Laboratory studies, including large rodent studies by the US National Toxicology Program9 and Ramazzini Institute of Italy,10confirm these biological and health effects in vivo. As we address the threats to human health from the changing environmental conditions due to human activity,11 the increasing exposure to artificial electromagnetic radiation needs to be included in this discussion. 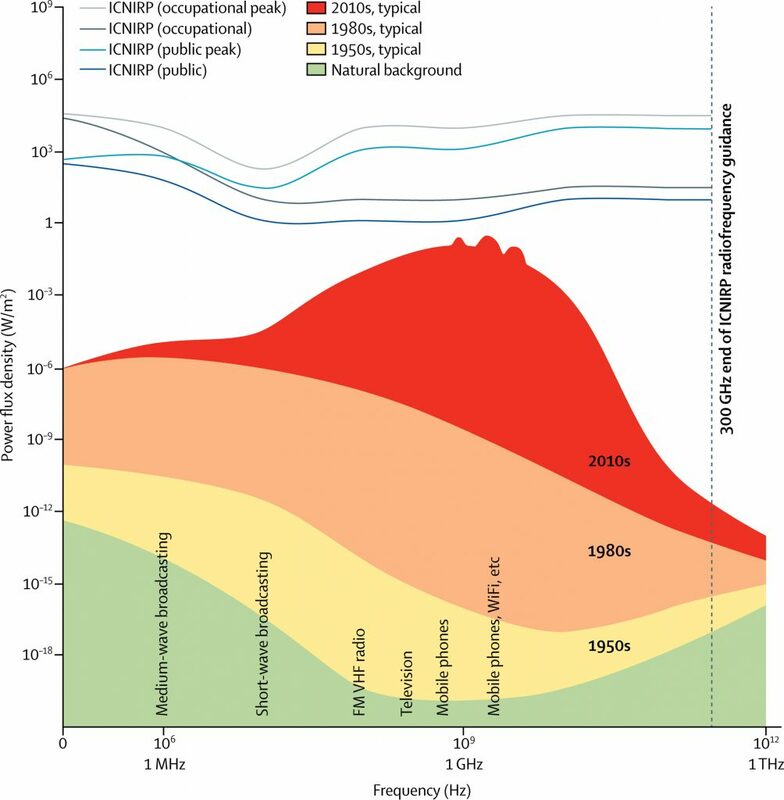 Unprecedented human exposure to radiofrequency electromagnetic radiation from conception until death has been occurring in the past two decades. Evidence of its effects on the CNS, including altered neurodevelopment14 and increased risk of some neurodegenerative diseases,15 is a major concern considering the steady increase in their incidence. Evidence exists for an association between neurodevelopmental or behavioural disorders in children and exposure to wireless devices,14 and experimental evidence, such as the Yale finding, shows that prenatal exposure could cause structural and functional changes in the brain associated with ADHD-like behaviour.16 These findings deserve urgent attention. At the Oceania Radiofrequency Scientific Advisory Association, an independent scientific organisation, volunteering scientists have constructed the world’s largest categorised online database of peer-reviewed studies on radiofrequency electromagnetic radiation and other man-made electromagnetic fields of lower frequencies. A recent evaluation of 2266 studies (including in-vitro and in-vivo studies in human, animal, and plant experimental systems and population studies) found that most studies (n=1546, 68·2%) have demonstrated significant biological or health effects associated with exposure to anthropogenic electromagnetic fields. We have published our preliminary data on radiofrequency electromagnetic radiation, which shows that 89% (216 of 242) of experimental studies that investigated oxidative stressendpoints showed significant effects.7 This weight of scientific evidence refutes the prominent claim that the deployment of wireless technologies poses no health risks at the currently permitted non-thermal radiofrequency exposure levels. Instead, the evidence supports the International EMF Scientist Appeal by 244 scientists from 41 countries who have published on the subject in peer-reviewed literature and collectively petitioned the WHO and the UN for immediate measures to reduce public exposure to artificial electromagnetic fields and radiation. Evidence also exists of the effects of radiofrequency electromagnetic radiation on flora and fauna. For example, the reported global reduction in bees and other insects is plausibly linked to the increased radiofrequency electromagnetic radiation in the environment.17Honeybees are among the species that use magnetoreception, which is sensitive to anthropogenic electromagnetic fields, for navigation. Man-made electromagnetic fields range from extremely low frequency (associated with electricity supplies and electrical appliances) to low, medium, high, and extremely high frequency (mostly associated with wireless communication). The potential effects of these anthropogenic electromagnetic fields on natural electromagnetic fields, such as the Schumann Resonance that controls the weather and climate, have not been properly studied. Similarly, we do not adequately understand the effects of anthropogenic radiofrequency electromagnetic radiation on other natural and man-made atmospheric components or the ionosphere. It has been widely claimed that radiofrequency electromagnetic radiation, being non-ionising radiation, does not possess enough photon energy to cause DNA damage. This has now been proven wrong experimentally.18, 19Radiofrequency electromagnetic radiation causes DNA damage apparently through oxidative stress,7 similar to near-UV radiation, which was also long thought to be harmless. Smith-Roe SL, Wyde ME, Stout MD, et al. Evaluation of the genotoxicity of cell phone radiofrequency radiation in male and female rats and mice following subchronic exposure. Environmental Mutagenesis and Genomics Society Annual Conference; Raleigh, NC, USA; Sept 9–13, 2017.